On October 4, 1813, some of Tecumseh’s warriors try to slow down the advancing American troops at the forks of the Thames. The Natives demolish the upper part of the bridge at McGregor’s Creek and then hide in the trees on the north bank of the stream. When Harrison’s army arrives at the remnants of the bridge, the warriors open fire. The skirmish lasts two hours. The warriors kill three Americans and wound six others but in the end there is little they can do to stop the three thousand strong U.S. Army. Tecumseh retreats upriver. Tecumseh saving prisoners during the Northwest Indian War. Photo from the book, Encyclopedia of American Indian Wars, by Jerry Keenan. The following day, what is left of Tecumseh's confederacy joins the British Army on the north bank of the Thames near Moraviantown. Procter has finally decided to turn and face the Americans. The warriors don’t like to fight in the open and take up position in a dense swamp to the right of the British lines. They will try to turn the American flank and squeeze the enemy towards the river. Tecumseh’s warriors hear the bugles sound the US cavalry charge against the British lines. Within minutes, the Americans advance against the the Indians as well. Colonel Richard Johnson’s “Forlorn Hope” squad leads the US cavalry charge on the swamp. The warriors ferociously resist the American attack and kill or wound all twenty of Johnson’s men. As Tecusmeh expected, the swamp’s undergrowth and wet ground forces the American horsemen to dismount. With Tecumseh’s war cries spurring them on, the warriors fight the US soldiers in bitter hand-to-hand combat. 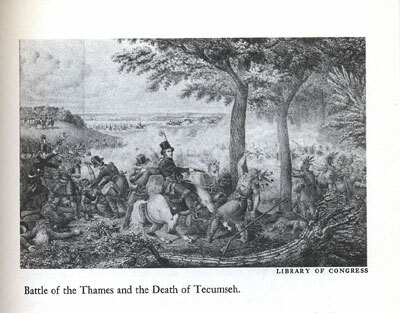 The death of Tecumseh during the Battle of Thames, in which U.S. forces were commanded by William Henry Harrison, in 1813. Photo from the book, Encyclopedia of American Indian Wars by Jerry Keenan. The Americans are not kept at bay for long, however. The warriors don’t realize that they have been abandoned by their British allies. Procter’s troops put up little resistance to the US charge. By the time the Natives start fighting, the British line has broken. The Redcoats are scattered through the forest, running for their lives. This enables the Americans to quickly swing to the left and concentrate on the battle in the swamp. The Native army is greatly outnumbered. Tecumseh is perhaps the only chief able to inspire the warriors to continue fighting in a situation like this. But the Shawnee leader’s unmistakable war cries have disappeared from the roar of the battle. His life-long enemies, the Kentuckians, have cut him down. When word of Tecumseh’s death and British Retreat spreads, the Natives are shaken. An American soldier later recalled that, “they gave the loudest yells I ever heard from human beings and that ended the fight.” The warriors slowly withdraw into the forest. In total, six chiefs and nine warriors are killed, including Wahsikegaboe (Firm Fellow), the husband of Tecumseh’s sister Tecumapeace. Tecumseh’s once-proud army is destroyed. After the battle, only some 300 warriors make the trek to the British-controlled head of Lake Ontario. The two thousand native women and children who have followed the retreat are reduced to begging for food at the village of Burlington. Across the Detroit River, chiefs from six tribes sign a peace treaty with Harrison. They leave their families as hostages. Native women and children are seen scavenging the streets for food scraps and eating the offal discarded from slaughterhouses.